Metatarsalgia is a word that means pain around the ball of the foot. There are many potential reasons for this. Irritation of the metatarsophalangeal joints in the ball of the foot. The most common reason for metatarsalgia is irritation and inflammation of the metatarso-phalangeal (MTP) joints. When the MTP joints become inflamed, swelling can involve the whole front of the foot. Often it can make the ball of the foot feel like the sock is bunched up or a marble is being stepped on. It is usually difficult to barefoot on a hard surface. 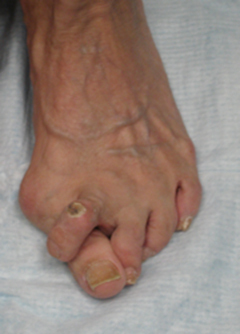 About fifty percent of the time, a hammertoe will develop. A hammertoe is a deformity that causes the toe to curl so that the joint of the toe begins to push up against the shoe and the end of the toe. Unfortunately, there is no way to straighten the toe short of surgery. Fortunately, often the pain goes away despite the deformity. Irritation of the MTP joint develops because of overload of this joint. The overload of the joint can occur for a long time before the development of the pain. Change in the way that we use our feet. Shifts in pressure on the front of the foot due to bunions or displaced stress fractures. A ligament at the bottom of the MTP joint called the volar plate controls the position of the joint. When the joint is inflamed, the ligament weakens and tears. The tear loosens the joint, allowing it to extend. Tendon tension within the toe flexes the other joints as the MTP joint extends. 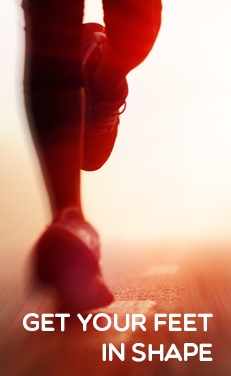 The first step on the road to recovery is to control the pain and reduce the pressure on the forefoot. It is common for the pain in the front of the foot to resolve on its own over a period of monthe. Non-steroidal anti-inflammatory medications such as ibuprofen and naprosyn are effective pain medications,but do little to cure metatarsalgia. Activities that place a great deal of stress on the metatarsalgia such as jogging and sports may need to be temporarily curtailed and replaced by other activities such as bicycling and swimming. Shoe wear that prevents concentration of pressure on the forefoot is very helpful. Rocker-soled shoe wear or toners are very effective at this. These shoes are made by many companies including Dansko, MBT and Skechers and are all slightly different in fit and feel. Arch supports seem to give relief also, but people are just as satisfied with inexpensive over-the-counter arch supports as expensive custom arch supports.